Ode for the Birthday of Queen Anne (HWV 74) is a secular cantata composed by George Frideric Handel to a libretto by Ambrose Philips, of which the first line, "Eternal source of light divine", provides an alternative title for the work. It was probably composed during January 1713 for a performance on 6 February 1713, although there is no record of the performance having actually taken place. Other catalogues of Handel's music have referred to the work as HG xlviA; and HHA i/6. The cantata celebrates Queen Anne's birthday, and the accomplishment of the Treaty of Utrecht (negotiated by the Tory ministry of Anne in 1712) to end the War of the Spanish Succession. It is scored for 3 solo voices, choir and chamber orchestra. Queen Anne was said by the Duke of Manchester to be "too careless or too busy to listen to her own band, and had no thought of hearing and paying new players however great their genius or vast their skill." 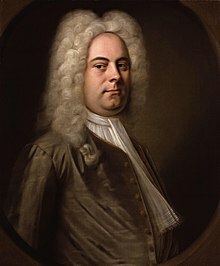 Nevertheless, and whether or not she ever heard this ode for her birthday, she granted Handel a "pension" (subsidy for living expenses) of two hundred pounds a year, for life. Ambrose Phillips, author of the text of "Eternal Source of Light Divine"
Who fix'd a lasting peace on Earth. They celebrate this happy day. Made glad by this propitious day. And blasted faction glide away. Secure in this auspicious day. And this the most important day! On 23 August 2007, Kate Royal performed the aria "Eternal source of light divine" at the Proms. On 19 May 2018, Elin Manahan Thomas performed the aria "Eternal source of light divine" as the bridal entry music for the wedding of the Duke and Duchess of Sussex, accompanied by the event's orchestra and with David Blackadder playing the trumpet obbligato. Alfred Deller (countertenor), Mary Thomas (soprano), Maurice Bevan (bass), Deller Consort, Oriana Concert Choir, Vienna Symphony Chamber Orchestra, Alfred Deller (conductor). Vanguard Records 8113. Released 1963. James Bowman (countertenor), Emma Kirkby, (soprano), David Thomas, (bass), English Chamber Orchestra, Choir of Christ Church Cathedral, Oxford, Simon Preston (conductor). Decca 4666762. Released 1978. James Bowman (countertenor),Gillian Fisher (soprano),Michael George (bass), Choir of New College, Oxford, The King's Consort, Robert King (conductor). Hyperion Records CDA66315. Released 1989. Robin Blaze (countertenor), Susan Gritton (soprano), Michael George (bass), King's College Choir, Cambridge, The Academy of Ancient Music, Stephen Cleobury (conductor). EMI Classics CDC 5571402. Released 2001. Andreas Scholl (countertenor), Helene Guilmette (soprano), Andreas Wolf (bass), Vocalconsort Berlin, Akademie fur Alte Musik Berlin, Marcus Creed (conductor). Harmonia Mundi 0794881924325. Released 2005. ^ a b Hicks, Anthony (2001). Sadie, Stanley; Tyrrell, John, eds. The New Grove Dictionary of Music and Musicians. x (2 ed.). London: Macmillan. p. 784. ^ a b King, Robert. "Program notes for "Music for Royal Occasions'" (PDF). Hyperion Records. Retrieved 20 September 2013. ^ "Prom 52". bbc.co.uk. Retrieved 2018-05-25. Handel Week: Ode for the Birthday of Queen Anne. (The complete programme, from the BBC Radio 3 series "Discovering Music", is not available, but there is a clip of "Eternal source of light divine"). BBC.